As an indie iOS app developer, keeping up with Apple’s hardware can get expensive fast. From the Mac to the iPhones and iPads. I’m focusing on native iPhone apps and currently use an iPhone 7 as my daily driver. I’m considering getting a new iPhone and want to find the right balance between 1.) phone size I want to use daily and 2.) phone is optimal for App Store Connect previews (videos) & screenshots. Since I’m an AR app developer, having iPhone hardware is essential (the Simulator doesn’t cut it). Looking at the state of iPhone hardware today (Dec 2018), some quick Googling shows that the iPhone 7, 7+/8+, and X form factors are the most common in the US. When we look at Apple’s App preview & screenshot guidelines, it tells us that the 5.5 inch (iPhone 8+, etc) form factor is required (screenshots) and recommended (app previews). For 2019, my guess is that supporting the 5.5 inch (8+) form factor and the 5.8 inch (X/XS) on App Store Connect would give me the most bang for my buck. It would be nice to have both a XS & XS Max to test with, but that’s way out of my budget. Curiously enough, the app preview video resolutions are the same across the X line (X, XS, XS Max, XR at 886 x 1920 pixels (when portrait). The video resolution is bigger at 1080 x 1920 pixels for the plus line (8+, etc). Using App Store Connect, I was able to manually verify the different screenshot upload resolutions for the iPhone XS Max (1242 × 2688), iPhone XS (1125 × 2436), and iPhone 8+ (1242 × 2208). It seems like there is no point to try to take or upload iPhone XR screenshots. In summary, the iPhone plus (8+, etc) line is the most important for app previews & screenshots. After that, the XS & XS Max (in that order) will give you more App Store Connect coverage with diminishing returns. This entry was posted in Programming, Tech and tagged 5.5, 5.8, apple, iphone, xr, xs on December 16, 2018 by Rex. My personal daily driver is a 2011 MacBook Air (MBA). I’ve shipped 6 iPhone apps from it. For a computer bought in 2011, I’m happy with how long it has lasted. * Xcode runs poorly on my MBA. Storyboard, Simulator, and Playgrounds are barely usable. * macOS Mojave will not run on my MacBook Air. It’s only a matter of time before I’m locked out of macOS & Xcode updates. * Apple announced a Keyboard Service Program. * As a professional software developer, I can easily justify 2-3 year upgrade cycles. * My MBA is showing it’s age; the battery is virtually gone. * My MBA is able to run Xcode 9 (current) and will hopefully run Xcode 10 GM. * Buying after a new hardware refresh (minor CPU bump most likely) maximizes the currentness of the purchase. This may not be rational, but it’s a factor nonetheless. 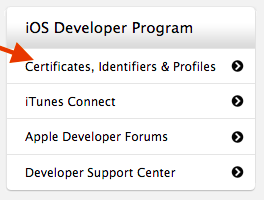 * My iPhone app development is primarily dependent on iPhone hardware updates & Xcode, not my Mac. * Indecision – since none of the current MBP options (2015 or 2017) are very appealing, I can wait it out. * I don’t like typing on the current generation MBP keyboard, but the next significant MBP hardware refresh is probably a few years away (too long). * USB-C – I’ve found a Multi-Port Adapter (dongle) that works for me. In retrospect, I should have bought a decently equipped 2015 MBP in 2015. If Xcode 10 GM doesn’t work on my Mac, then I’ll be forced to buy a new Mac right away. Otherwise I will wait around hoping Apple decides to update the MBP. This entry was posted in Tech and tagged air, apple, keyboard, mac, macbook, mba, mbp, pro, upgrade, xcode on June 23, 2018 by Rex. I’m new to computer vision and a lot of the basic concepts are very interesting. As an iOS developer, my interests comes from using CoreML & Apple’s Vision in apps to improve the user experience. Two common tasks are classification and object detection. Classification allows you to detect dominant objects present in an image. For example, classification can tell you that photo is probably of a car. Object detection is much more difficult since it not only recognizes what objects are present, but also detects where they are in the image. This means that object detection can tell you that there is probably a car within these bounds of the image. What’s important is that the machine learning model runs in an acceptable amount of time. Either asynchronous in the background or in real time. Apple provides a listing of sample models for classification at https://developer.apple.com/machine-learning/. For real time object detection, TinyYOLO is an option, even if the frame rate is not near 60 fps today. Other real time detection models like YOLO or R-CNN are not going to provide a sufficient experience on mobile devices today. One other interesting thing I came across is the PASCAL Visual Object Classes (VOC). These are common objects used for benchmarking object classification. These are common objects used to train classification models. Computer vision used with machine learning has a tremendous amount of potential. Whether used with AR or other use cases, they can provide a compelling user experience beyond Not Hotdog. This entry was posted in Programming, Tech and tagged apple, ar, computervision, ios, machinelearning, ml, pascal, tinyyolo, vision, yolo on April 24, 2018 by Rex. There are a ton of guides out there for updating your app(s) to support the iPhone X. If you create your view programmatically, you can use iOS 11’s safeAreaLayoutGuide. If your app targets iOS 10 or below, you can use the availability condition, #available(). With the Storyboard, one thing I appreciate from Apple is making the safe area layout guide backwards deployable. Apple told us in WWDC 2017 Session 412 that Storyboards using safe areas are backwards deployable. This means you can switch to using the safe area layout guide in Interface Builder even if you still target iOS 10 and older. I don’t always use the storyboard for my layouts, but for apps that I need to update, this backwards deployability helps a lot. This entry was posted in Programming and tagged apple, available, ios11, iphone, iphonex on October 25, 2017 by Rex. Here is a quick guide for saving photos on your 4th generation Apple TV so that you can use them as a screensaver on your Apple TV (without constantly have your computer on for Home Sharing). That hopefully wasn’t too complicated to do. I wanted to post this since it wasn’t clear to me from googling if you could save photos to your Apple TV (or you had to always stream via Home Sharing). As for the Apple TV, it feels like Apple Watch territory. Something that is nice to have, but nowhere near necessary. Their app stores are still early and widespread developer support is uncertain. This entry was posted in Tech and tagged apple, appletv, home, itunes, screensaver, sharing, tv on October 22, 2016 by Rex. 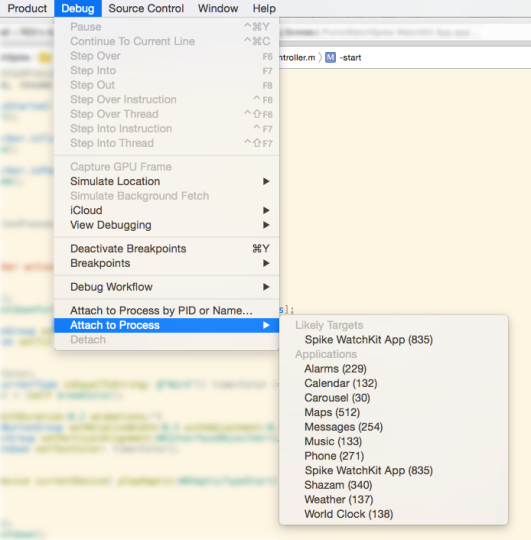 The WatchKit Framework’s WKInterfacePicker has some level of customization in Interface Builder. Style is the most important attribute since it heavily influences the type of Picker. The options for Style are List, Stack, and Sequence. List is the standard iOS-style 3d list of text. Stack allows you to flip through images as if it were a deck of cards. Sequence lets you move between images without any intermediate transition effect. For a good look, I’d recommend Big Nerd Ranch’s blog post. Focus presents an outline around the currently focused/selected Picker. 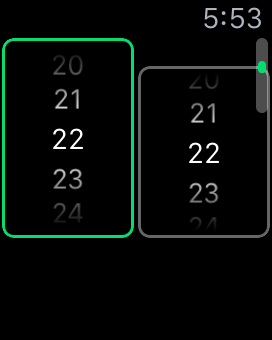 This is helpful if you have multiple WatchKit pickers or multiple elements for selection (think “Customize” for your watch face). The options are None, Outline, and Outline with Caption. The last option, “Outline with Caption”, comes into effect if your Style is Stack (or possibly Sequence), see an example here. Indicator has two options: Disabled or Shown While Focused. The documentation wasn’t very clear: “A value indicating whether the picker uses an indicator to convey context about the number of picker items and which item is selected.” As far as I can tell, Disabled means the standard look, and the “Shown While Focused” adds a scroll bar helper on the right side of the watch. Enabled is a helpful option that is either on or off. Enabling it or not doesn’t affect the view. When the picker is enabled, it allows the user to use the picker. This attribute can be set or unset programmatically with -setEnabled. Hopefully this quick explanation of the different WKInterfacePicker attributes helps you out. 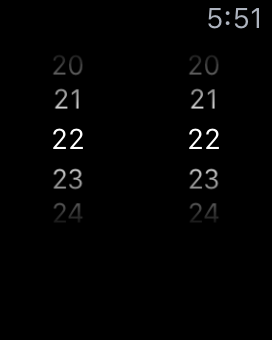 The digital crown (AKA dial) & the WKInterfacePicker provides an extremely powerful, convenient input method for your watch app users. 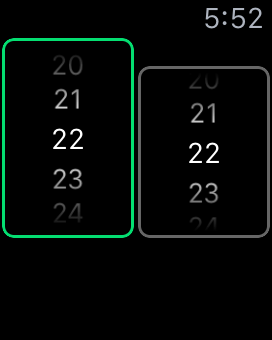 This entry was posted in Programming and tagged apple, applewatch, attributes, illustrated, watch, watchos2, WKInterfacePicker on September 20, 2015 by Rex.